During the create account process, make sure you provide payment information, otherwise you won’t be able to use S3. There’s no registration fee, you will only be charged for what you use, if you exceed the AWS Free Usage Tier. You don’t need to create the S3 buckets manually. Discourse will automagically create them for you if they do not exist. The bucket name should not contain periods as this will cause huge HTTPS problems for you. When you set up the permissions, make sure that you allow public ACLs, otherwise uploads will fail. Sign in to AWS Management Console and search for the “IAM” service to access the AWS Identity and Access Management (IAM) console which enables you to manage access to your AWS resources. We need to create a user account, so click on the Users link on the left side and then the button. Type in a descriptive user name and make sure the “Programmatic access” checkbox is checked. Here’s the critical step: Make sure you either download the credentials or you copy and paste somewhere safe both Access key ID and Secret access key values. We will need them later. Once the user is created, we need to configure the user’s permission. Select the user you’ve just created in the upper panel, click on the Permissions tab in the lower panel and then click the link. Make sure you replace both occurrences of “name-of-your-bucket” with the name of the bucket you will use for your Discourse instance before applying the policy. Now that you’ve properly set up S3, the final step is to configure your Discourse forum. Make sure you’re logged in with an administrator account and go the Settings section in the admin panel. You need to append a prefix to the bucket name if you want to use the same bucket for uploads and backups. The “s3_region” setting is optional and defaults to “US East (N. Virginia)”. You should enter the location (eg. “EU (Frankfurt)”) that is nearest to your users for better performance. If you created the bucket manually, you’ll need to select the region you selected during the creation process. That’s it. From now on, all your images will be uploaded to and served from S3. Do you want store backups of your Discourse forum on S3 as well? Take a look at Configure automatic backups for Discourse. I reused the same bucket for uploads and backups and now backups aren’t working. What should I do? The easiest solution is to append a path to the s3_backup_bucket. Here’s an example of how your settings should look afterwards. You can use the S3 Console to move existing backups into the new folder. Do I really need to use separate buckets for uploads and backups? Minimum S3 IAM Role Actions? Images are disappearing off of s3! How does i use some cloud file system in discourse? Would it be worth resizing uploaded images (to save space)? File Reference and Deletion, will it really be deleted? if you exceed the free usage tier. Note that the free usage tier only lasts for 12 months, so either don’t forget about it and leave it active, or create an alert in AWS to have it notify you when it charges you money. Hitting the like button wasn’t enough, I just have to saw this is awesome. Over at Axis and Allies .org Forums: Axis and Allies.org Boards - Index (which is down right now ) people have uploaded tens of thousands of files and it’s unmanageable with old style forums. Just curious, what makes it unmanageable? Store file hashes and run recovery jobs that figure out where files really are based on a hash and a full scan of the filesystem. Store attachements in the db, which is a world of pain. I agree, I probably wasn’t specific enough. SMF doesn’t really allow you to create your own directory structure. If you write a script to move a file and update the database, it still won’t find it. There’s a bunch of hardcoded crap in the code. Our design should be safe for moving the install, our tables really should only store relative locations. I followed these instructions to the letter and I’m getting “Sorry, there was an error uploading that file. Please try again.” every time. Have you got any errors in the logs? What’s your S3 user policy? I have the same “signature” problem. Edit: I just changed the keys, and it went away. Maybe I had a trailing space? @haiku would you check yours? Installed latest discourse today. Setup S3 using the guide above but when creating new topic with image upload, it still loads from local /uploads folder. 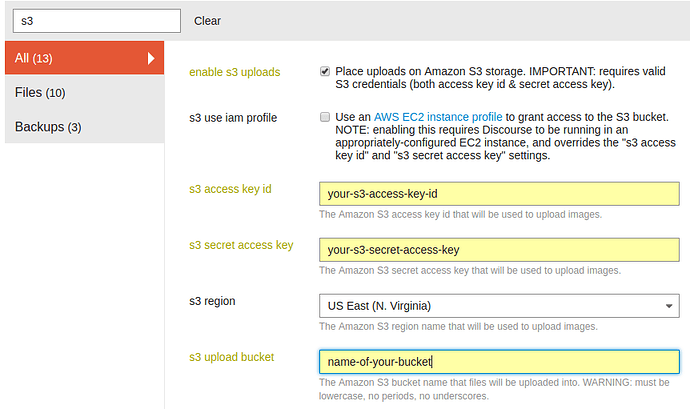 So I checked Amazon S3 console, there was no bucket created. Tried creating bucket manually, but same issue. Checked keys such that there is no trailing space. Checked logs, there was no errors relating to S3. It is working now, guess it was some sort of delay/cache? Does anyone have any suggestions about how to migrate file system stored images into S3? If I need to write a script to make it happen that’s cool (and I’d be happy to share it), just figured I’d ask here before diving into it. I would also like some kind of howto for this. Might want to add to the howto a recommendation to not use dots in the bucket name. This is allowed by AWS but prevents you from referencing the bucket under SSL. Very good point, done in the code and here too. We’ve had 5-6 reports of bucket problems due to periods in the name, something we definitely want to avoid in the future.